The project was massive: Four sets of spectacular model homes for a gated community set in the rolling hills above Newport Beach, Calif. – designed by three different landscape architects and each featuring its own creative use of water. By the time he left the site, says pool builder Kent Hart, he had installed more than 20 vessels of various types, shapes and sizes at the One Ford Road development – and found unique challenges in executing the architects’ divergent visions. Not every upscale pool contractor has to be working with his or her own designs to be successful in building beautiful pools. Our company, for instance, has established its reputation by excelling at making the ideas of others come to life. 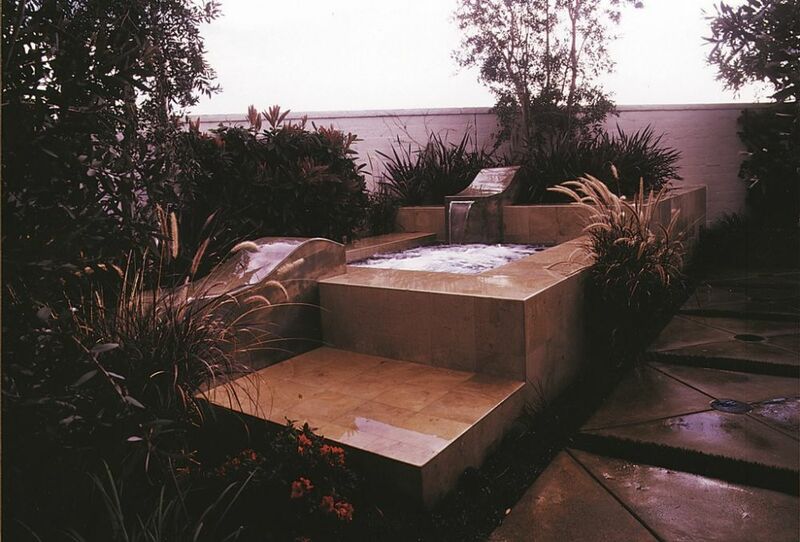 Examples of this can be found in the work we did at One Ford Road, a development where we were asked to follow through on designs prepared by three of Southern California’s best-known landscape architects. We’ve found here and elsewhere that when you work with highly creative people (including those who designed the pools, spas and waterfeatures pictured on these pages), the process can be truly rewarding, exciting and even fun. Of course, working at the highest levels of commercial and residential pool construction means you need to have your act together. These watershapes, for instance, were clearly critical to the overall impression the designers were looking to make – but where they had control of the aesthetics, it was left completely to us to make them work structurally and hydraulically. It was a rare opportunity for our firm, Aquatic Technologies of San Juan Capistrano, Calif. – one that has consumed a huge portion of our time and energy through the past two years. For us, the results you see here more or less speak for themselves: Once the watershapes were completed, the landscaping installed and these spectacular model homes fully appointed, each of the model homes represented the magnificent potential that can be realized when the design of the watershape is integrated into the overall scheme of things. Everything about this project is impressive. Developed by Pacific Bay Homes, the plan called for construction of nearly 400 homes ranging in selling price from $750,000 to $1,500,000. The architects came up with seven distinct styles and 22 floor plans and worked in conjunction with the landscape architects to make certain there were special features that made each home unique. In spirit, the developers were after the elegant diversity of classic California communities. According to landscape architect Julie Brinkerhoff-Jacobs of Lifescapes International, a Newport Beach firm whose work is featured at One Ford Road, the pattern-setters included the great residential neighborhoods of Pasadena and San Marino in Southern California and Hillsborough and San Jose’s Rose Garden District in Northern California. 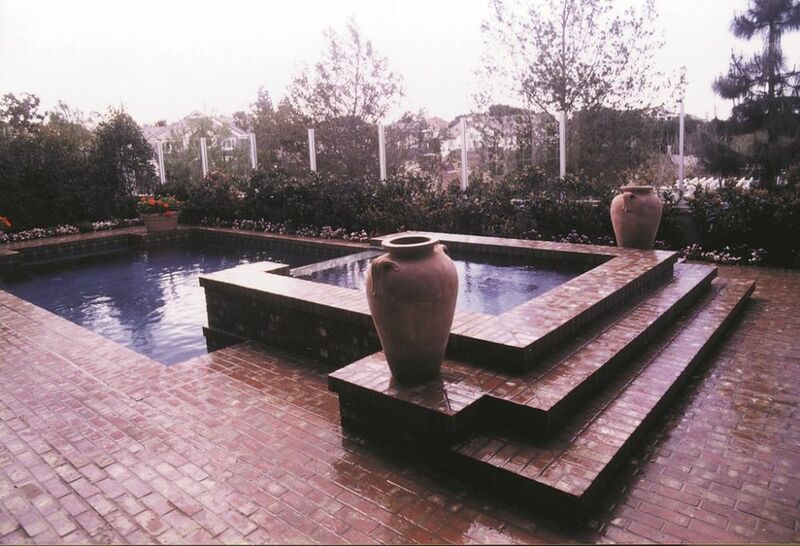 Our firm became involved largely because of our background in commercial pool construction. This gave us the right sort of experience in managing large-scale projects and preparing complete bids based on complex designs. We were also in our element because the development was to include a community pool. In fact, if there was a key to our getting the job, it was our familiarity with building competitive pools. This was where we placed our initial bid, then progressively moved into offers on other pools and waterfeatures being installed with the model homes. The development at One Ford Road has enabled our firm to stretch itself in a variety of ways. In addition to the model home pools, spas and waterfeatures pictured in the accompanying article, Aquatic Technologies also won contracts for two of the three community pools associated with the development, the first of which is currently under construction (left). 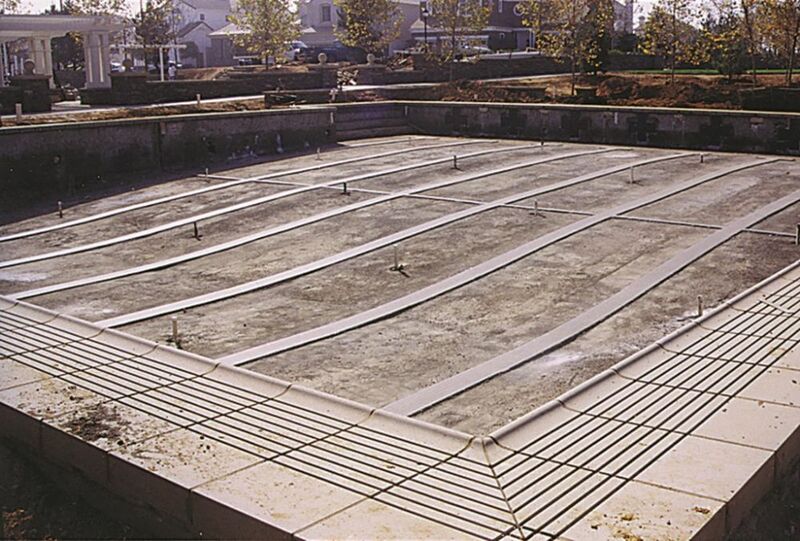 That pool will be a FINA-compliant competition pool with custom grated coping stones and a precision rim-flow system. At the other end of the complexity spectrum, we also installed a simple, circular fountain in the complex’s meditation garden/putting green area (right). We just kept changing gears in terms of scale and moving as methodically as we needed to in getting a big job done. The work began in the summer of 1997, at which point we received a pile of plans and specs prepared with varying degrees of detail. The first few months were consumed in dealing with the bureaucracy: estimating, bidding and submitting proposals. Although it was intimidating at first because of the sheer volume of the work, once the process began in earnest and I started getting answers to my questions and could nail down the particulars, each separate installation began to look manageable. We soon discovered that working on new construction in this manner can be a real pleasure. First of all, the designs were as beautiful as anything we’d ever seen – and the work went forward without the emotions and tribulations that can characterize working with high-end residential customers on an individual basis. There was no changing of minds or balking at price, no arguing about options: We had sets of well-conceived plans and simply made them happen. Access and scheduling were trouble-free, and we quickly discovered that there are efficiencies and economies in working on sets of pools, all next to each other, on lots where fences (and even the homes, in some cases) have not yet been built. This made our work with subcontractors extremely cost effective: When you’re building on sites right next to each other, it’s no problem to have a crew come and plumb three or four pools all at once or plaster three pools, all in a day. In addition, we didn’t have to worry about tearing down and rebuilding walls, disturbing neighbors, running over anyone’s dog or traipsing through anyone’s prized daisies. The grading had all been done, trash and clean-up were non-issues, and we didn’t have to re-sod any lawns or re-pour any slabs. I caught myself more than once thinking that this was the only way to build residential pools – maybe a bit too easy, in fact. Best of all, the work we were asked to do at One Ford Road was truly beautiful and completely rewarding in a professional sense. These designs incorporated a variety of interesting materials and a slew of fine decorative touches. As you’ll see in the photographs, we were working with design values and aesthetics that make these models truly super. Designed by Borthwick, Guy, Bettenhausen Landscape Architects, Irvine, Calif.
One set of models for the One Ford Road development is known as the “Carmel Series” and is based thematically on coastal California living in the era of Craftsman/ Cottage-style homes built during the first half of the 20th Century. Comfort, intimacy and touches of upscale elegance and grace are achieved through designs that include casual architectural and landscaping elements juxtaposed with clean, modernist lines. 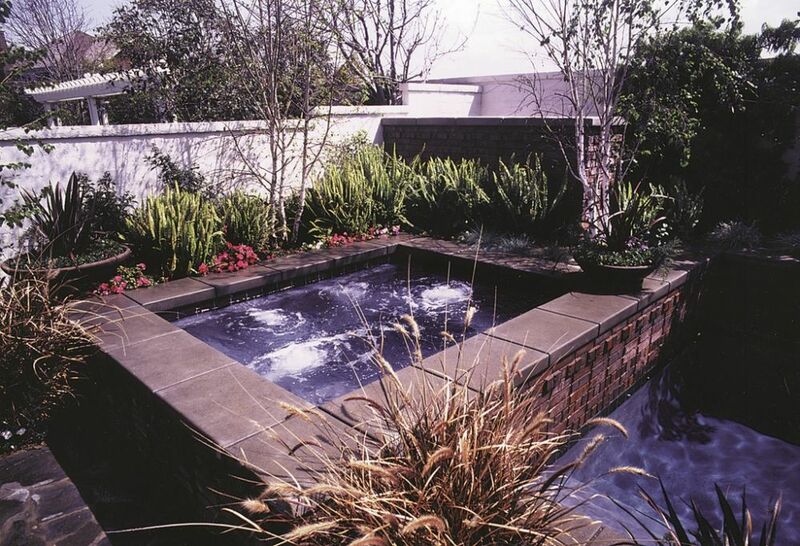 The pool/spa combination (left and middle) is designed to echo the design of classic cottage-style homes found in California’s upscale coastal regions. The brick details around the rectilinear pool and raised spa and the casual use of plant materials combine to create a comfortable, intimate outdoor environment. A more formal approach to the coastal California ideal is expressed in this home’s “art collector” theme (right). A dramatically abstract “arc-fall” spills into a raised concrete spa, set off by the geometric paving and tile details and supported by stylized modern landscaping. 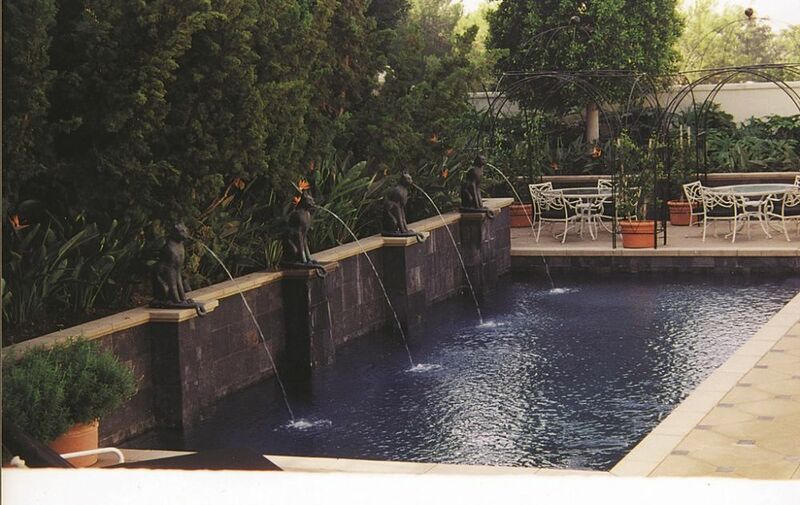 Designed by Lifescapes International, Newport Beach, Calif.
Models in the “Stonybrook Series” were designed as mature garden settings featuring beautiful pools, spas, fountains and exterior entertainment areas. The focus here is on presenting prospective buyers with a full array of exterior design and garden possibilities, including amenities such as barbecues, shade structures and intimate garden retreats. 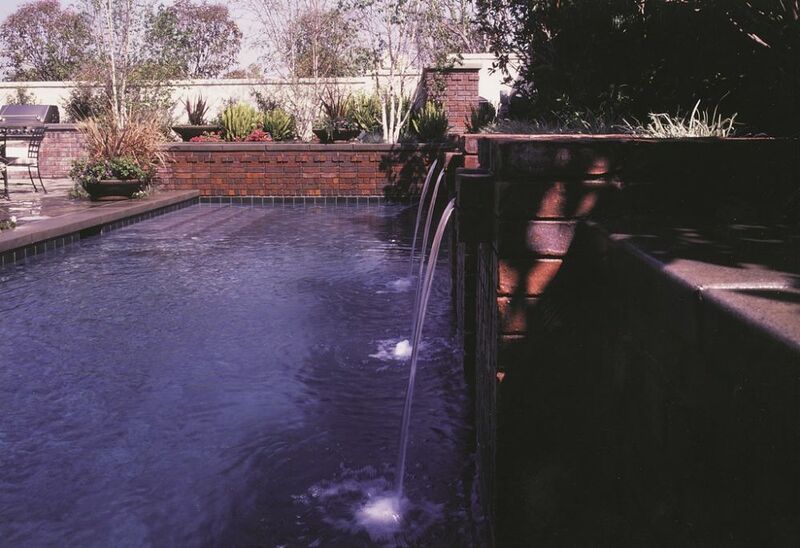 With its used brick and ceramic vases, the look of this pool/spa combination complements the mature pines, magnolias and assorted specimen trees that dot the yard (left and middle). Grays and reds in the plaster and tile details give the design an understated sense of elegance and warmth. 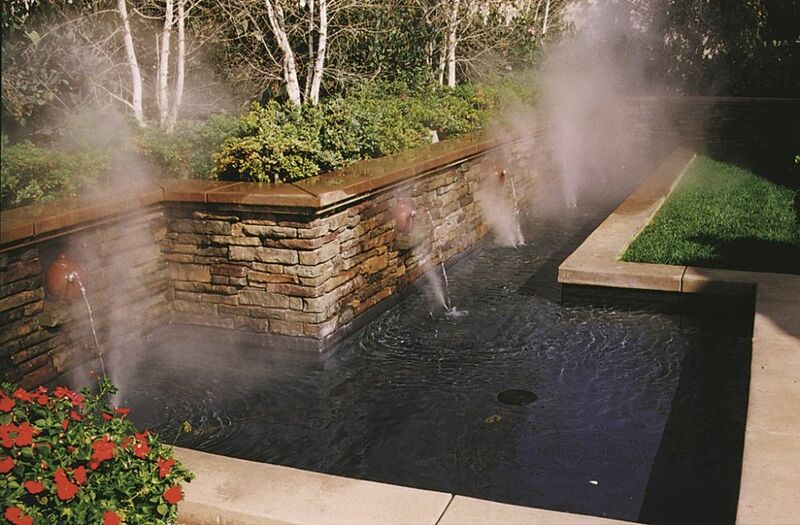 This dramatic, curving water wall sounds as beautiful as it looks (right). 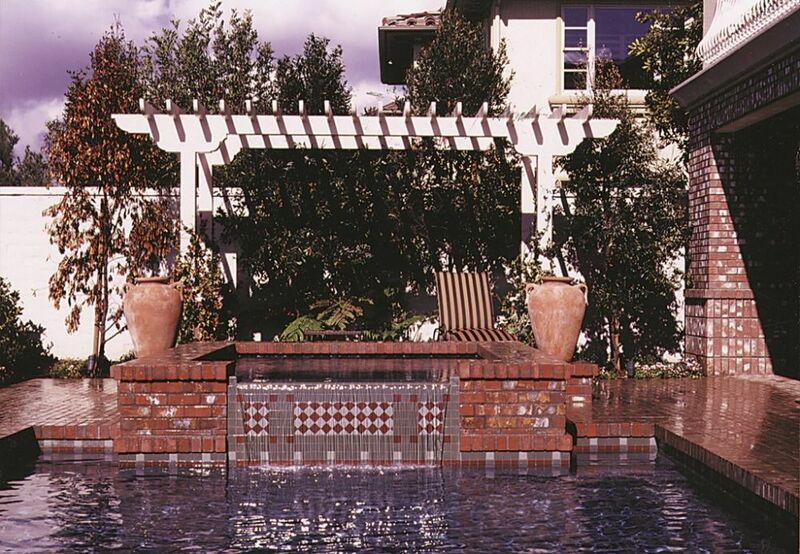 The subtle symmetry of the pools is articulated by the cantilevered paving stones and tile details, while the potted flowers and small specimen trees work in harmony with the water elements to create an intimate and restful setting. Designed by Burton and Associates, San Diego, Calif. The idea behind the designs included in the development’s “Summerhouse” and “Providence” models was to inspire people with details and help them envision the sorts of custom, personal features they could include in decorating their exterior spaces. Whimsical sculptures (spouting cats, dancing frogs and steaming teapots, among others) are used to create visual focal points that make a genuine impression. 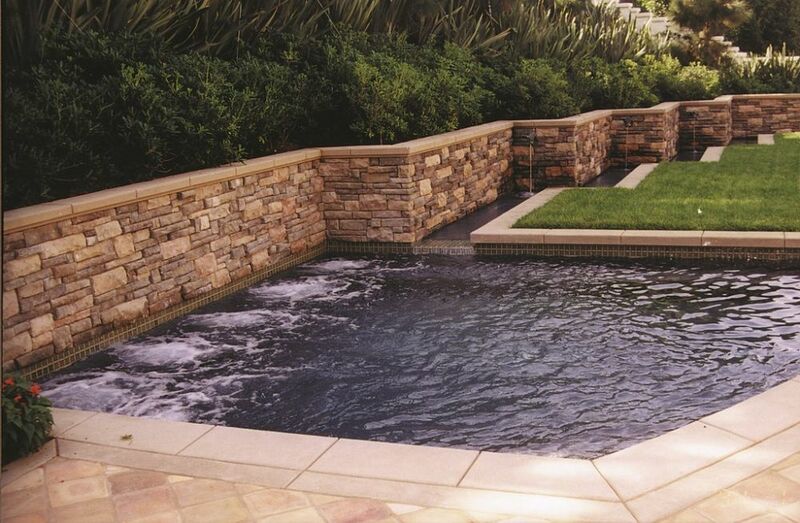 In all three of these projects, the pools are set back against low walls faced with tile and faux-ledger rockwork and topped by lush landscaping (top left, middle left and middle right). 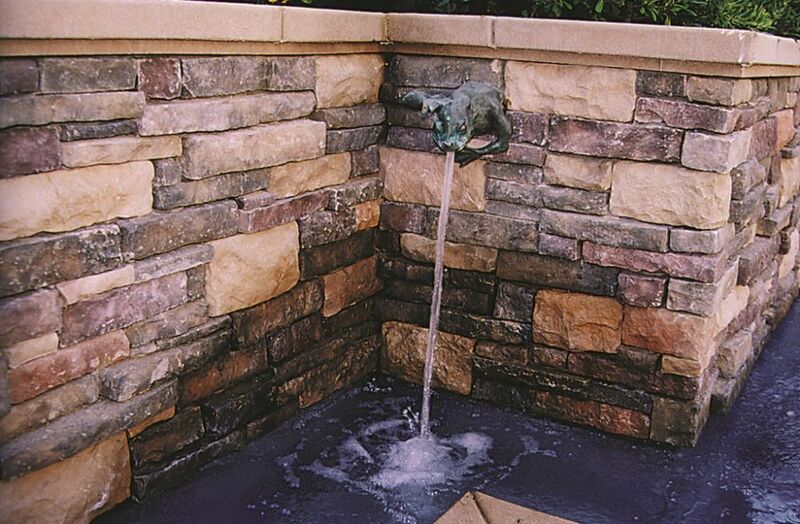 This provides for efficient use of available space while creating intimate settings rich with water, stone, tile and greenery – not to mention the occasional spitting amphibian (top right). 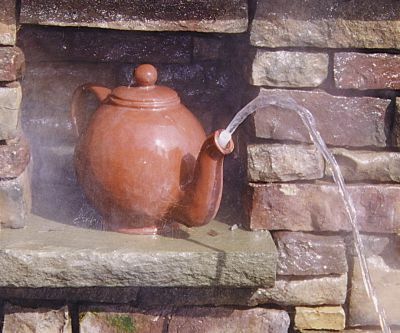 Teapots in nooks of rough-hewn stone, complete with special mist emitters, create a steamy impression in a small courtyard waterfeature (lower left and middle left). Given its position in a model home, this is less an aesthetic recommendation than it is a prod to the imagination – one intended to broaden the viewer’s perspective on what can be accomplished in modern exterior design. Ken Hart owns and operates Aquatic Technologies, a watershape-construction firm based in San Juan Capistrano, Calif. A pool-industry veteran with more than 20 years’ experience, he began his career with Fafco, a manufacturer of solar-heating equipment. After 10 years with the firm as sales manager, he left in 1987 to join Mission Pools of Escondido, Calif., where he served as manager of the firm’s commercial division and as a senior project manager. He founded his own company in 1997. A regular instructor for pool construction seminars at trade shows, Hart has taught classes on the subject at the California Polytechnical Institute at Pomona.